The type of earth you lay your foundations on can have repercussions for your house for decades after it’s been built, and for the course of its whole life - this is especially the case if you have a concrete slab floor. The term 'reactive soil' doesn't have anything to do with it being contaminated in any way (it's not radioactive); rather, it refers to the way the soil reacts to changing moisture content. All clay-based soils have the potential to change volume and shift with changes in the amount of moisture in the soil - and are sometimes called 'reactive soils' because of this. The amount that soil is likely to shift defines how 'reactive' it's considered to be. Some soils have a greater potential to change volume than others, and this amount of potential needs to be measured with a soil test to make sure your house's footings are designed in a way that helps protect it from soil movement that might otherwise cause it to sink or buckle. To make sure that the right type of subfloor is built for your home, your site will need to be tested by a geotechnical engineer. The engineer will take soil samples from the site, subject them to varying tests and then specify the correct site classification according to Australian Standard AS 2870/2011 - Residential slabs and footings. This rating indicates how reactive the soil is, and will help your structural engineer to determine what sort of footing system is suitable for your site in what are known as 'normal wet' and 'normal dry' conditions. Moderately reactive clay or silt sites. May experience moderate ground movement as a result of soil conditions and moisture changes. Highly reactive clay sites. May experience a high amount of ground movement as a result of soil conditions and moisture changes. Highly reactive clay sites. May experience very high ground movement as a result of soil conditions and moisture changes. Extremely reactive sites. May experience extreme amounts of ground movement as a result of soil conditions and moisture changes. Problem sites. The ability of the soil to evenly bear a load is very poor. Sites may be classified as 'Class P' as a result of mine subsidence, landslip, collapse activity or coastal erosion (e.g. dunes), soft soils with a lack of suitable bearing, cut and/or filled sites, or creep areas. Ground movement as a result of moisture changes may be very severe, and these sites are typically subject to abnormal moisture conditions resulting from things like trees, dams and poor site drainage. If you are building on a Class P site you will need to consult a structural engineer. The 'D' in these classifications refers to 'deep' movements in soil due to deep variances in moisture. These classifications are mostly found in dry areas (e.g. north of the Great Dividing range, in places like Stawell, Horsham, Mildura, Bendigo, Shepparton and Wangaratta). Even with the right types of footings for the soil type, 'abnormal' changes in the moisture content of the soil beneath and around your house can cause problems. The forces and pressures that the reactive soil can exert when this happens can go beyond the capabilities of the slab's footing system, which can cause unsightly (and usually painfully expensive) damage to your house. Long wet periods - where water ponds for a long time and soaks into the ground around your footing system. Good drainage on the site where water's directed straight into the stormwater system can help to prevent this. Long dry periods - droughts, where the ground dries out and shrinks away from your footing systems. Damage during droughts can be avoided by keeping the soil around your house moist during droughts - concrete paths can also help keep soils moist. Leaking water - stormwater and sewerage pipes under a house are ticking time bombs for slabs. These create localised wet spots which can lift and cause damage to a house in a matter of weeks. The best way to prevent this kind of damage is to be diligent and repair leaking pipes as soon as they're detected. As of 2011, there are now requirements for these pipes to be fitted with flexible mechanical joints to help deal with movement in reactive soils. Uneven watering and planting around your house - Lack of water or excess watering, watering unevenly and unbalance planting can create problems for your footings. The risk from this kind of problem can be reduced by regularly watering your garden to keep it moist, and during drought, by trimming back some of your plants. Having a neat native shrub garden at one end of your house which only needs a little maintenance and a well watered lawn for the kids at the other is considered quite normal, it's a classic example of an 'uneven watering situation' that can lead to structural damage. Hot water systems and air conditioners - both of these systems typically have outflow pipes that can expel anywhere between 2 and 30 litres each day (depending on the season). If they're not directed into stormwater systems these outflow pipes can create localised 'hot spots' where reactive clays become wet, lift the ground and cause structural damage. The forces that reactive soil can generate through moisture variations is enormous. Technically speaking houses can be 'heavy' enough to resist these forces, but they'd have to be made of brick and be four or five storeys high. For all ratings, it's simply a matter of building a subfloor that's suitable for the soil type, and for the type, shape and size of house you want to build - and an engineer will be able to figure out what's most appropriate for your design and the site you're building on. 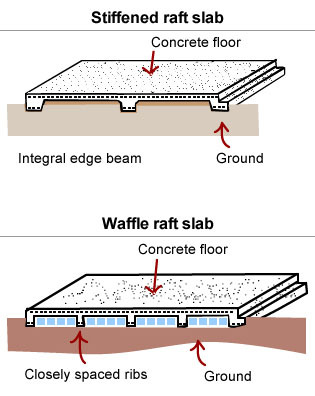 Most Class A and Class S sites will only need a basic reinforced slab with concrete beam footings underneath the edges of the slab, while sites with other classifications will require the slab to be stiffened. For slabs, this will require a series of cross beams in the slab - and sometimes piers too. This extra 'stiffening' helps to prevent the slab from bending and twisting as a result of moisture driven movements from underlying clays. For 'highly' and 'extremely' reactive sites and problem sites (i.e. Class H1, H2, E or P), a structural engineer will need to do a special assessment and advise on how to safely build a house without the risk of damage due to soil movement. In many cases, this will involve installing concrete piers or screw piers into the ground underneath the footing beams on the slab for added stability and support, to a depth sometimes below the depth where soil moisture variations are minimal. Moisture variations tend to be lower at greater depth in clay soils. Trees and their roots are often the cause of problems for house footings too. Regardless of the soil classification where you're building, you should take into account how the trees on or around your property might affect both your home, and your neighbours' homes. Ideally, you should consult an arborist, a geotech engineer or both to figure out what's likely to be OK and what could cause problems - and what the right approach is likely to be. In some cases a deep plastic root barrier embedded in the ground can help to prevent roots from growing around your home, and protect your foundations. You'll also need to consider how the potential root intrusion area may cause moisture variations (and therefore soil movement) past your own residential fence line - because the owner of a tree can become responsible for problems it causes to neighbouring properties. Likewise - regardless of the site classification, making sure there's adequate and appropriate site drainage (i.e. to stormwater drains) is a big part of protecting your home from reactive soil movement. Again, this is something a geotechnical engineer should be able to advise on. yep an interesting article, my block has been classified P in an AS soil test report, just been estimated $40,00 for piers etc. Interesting thing for me is its an old suburb built in the 1960s, its full of houses built without the benefit if piers etc, My family owns 5 houses within 100 meters of the site, my nephew lives next door on a 60 year old brick veneer house without any cracks and all the floors etc are level. My mother across the road in a weatherboard place. The block only became available because the existing house burnt down. how did those guys build those houses 60 years ago without piers and they stood the test of time. Are we building the pyramids? something to last a 1000 years? if its $ 40,000 for the footings it will put building out of our reach , it more than 20% of the building cost.